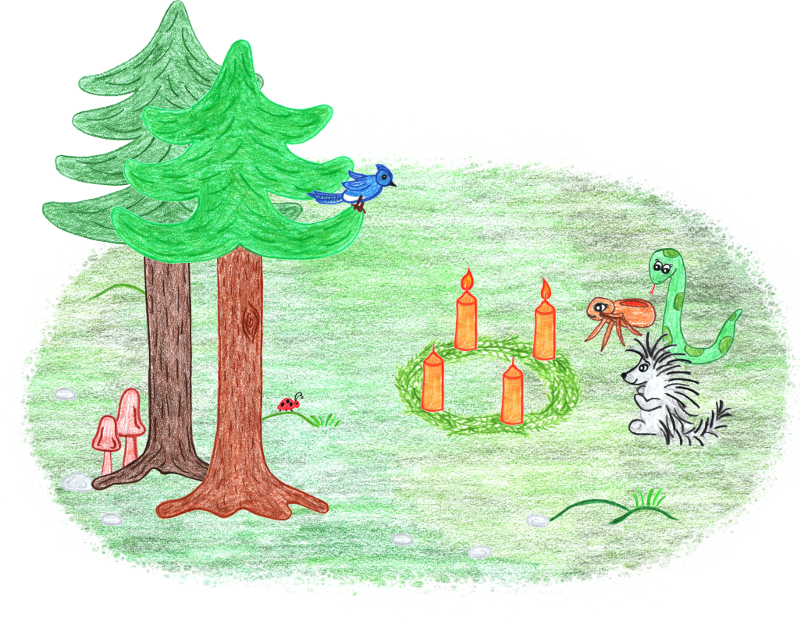 On behalf of all of Bucklethorn Forest, we wish every one of you a peaceful and joyful second advent! May you find time in this hectic and stressful season to meditate on the true meaning of Christmas to you. 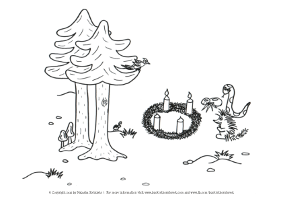 To help you get into the Christmas spirit I prepared a fun coloring sheet of Bucklethorn Forest’s second advent Sunday. Just download it, print it out and get started! Recently I have been getting very sweet and encouraging messages from friends who have bought my book. Their children find great joy in hearing the story, studying the pictures and the special task of finding the little ladybug hidden on every page. If you are still looking for a great, educational Christmas present for your child, maybe this children’s book is just the thing. If you click on the kindle version, you can have a sneak-peek into the book. 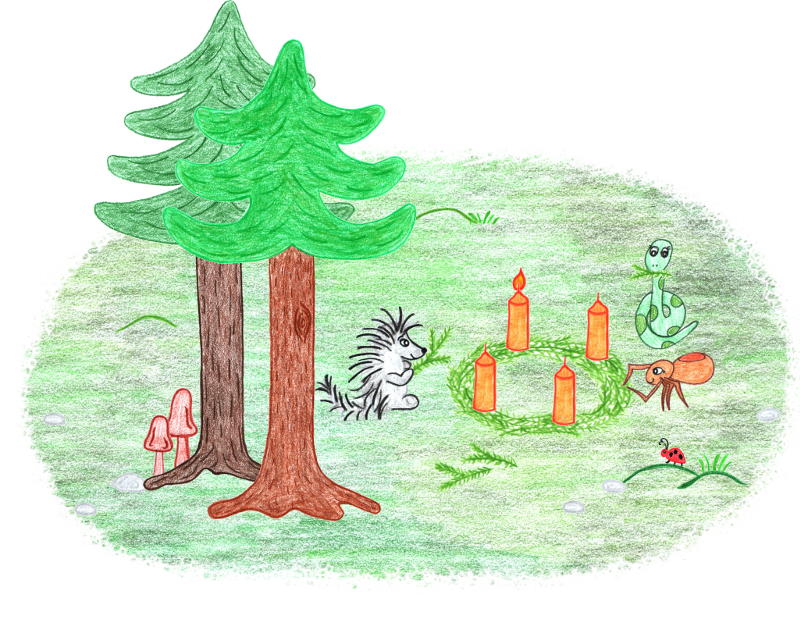 On behalf of Bucklethorn forest, we wish all of you a wonderful first advent! Welcome … but to what? Are you looking for an autumn craft for your child? Here is a simple, but cute idea with the bonus of it being a picture frame. My daughter is two and loves me tracing her hands or doing hand-prints. This craft doesn’t take long to make and is suitable for ages 1-6. The older the child, the more he/she can do on their own. A one year old will only be able to participate, by you tracing its hands and then him/her decorating the hand-prints and hedgehog. Still there is much fun to be had in the whole process and it’s a great activity for a rainy autumn day. Download the template and print it. 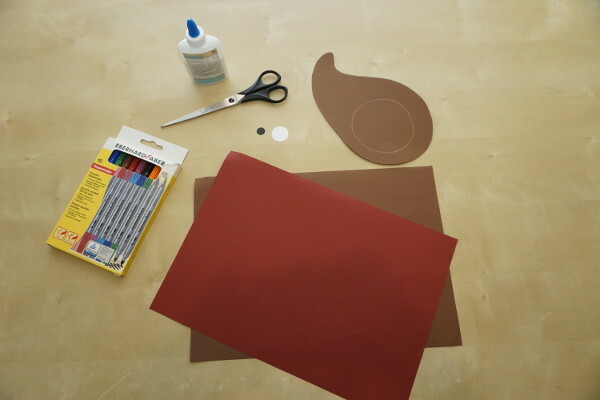 Use it to outline your hedgehog on the brown paper/card, then cut it out. Trace your child’s hand three times on the light brown or orange paper. Then cut them out. 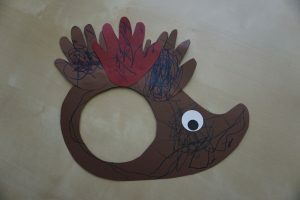 My daughter had great fun decorating and coloring in the hedgehog and hand-prints. Cut out one small circle using the white paper and stick it down as an eye for your hedgehog. Either cut out a black circle and stick it into the eye or just draw a black circle to complete the eye. Then stick down the hand-prints on the back of the hedgehog too and add a mouth under the eye. The only thing that is still missing, is sticking a photo of your child in your finished hedgehog picture frame. As a second option instead of tracing your child’s hands you can paint and then print them on your piece of paper, which will give you a different effect on your hedgehog picture frame. I chose to let my daughter color them, since she loves drawing. But next time I will try painting and printing her hands. Have fun and happy crafting with your child! This is a unique way to see the growth of your child. It needs some perseverance, but is easy to do and only takes a few minutes of your time each month and creates a beautiful lifelong memory. 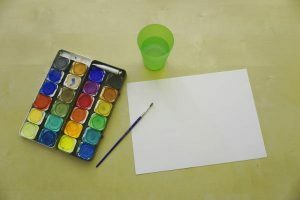 When your newborn is just a few days old, get the water colors out and using the paint brush paint one foot a color of your choice. Don’t worry the water colors wash off the baby’s skin very easily. Print your babies foot onto a paper you have prepared. Now paint the other foot a different color and print it on a piece of paper. I found a trick to make this project a bit easier, since children don’t always cooperate, is sticking the paper on a box or cardboard and holding the paper up against the baby’s foot instead of printing the foot onto the paper. Once the color dried, cut the footprints out, write next to each footprint your babies age (e.g. 1 week) and to help them last longer laminate them. 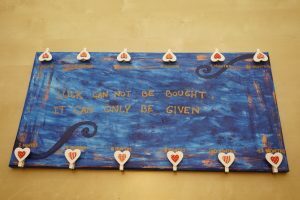 I hung them up on my daughter’s door, you could also hang them on a wall, the fridge or anywhere else you have a lot of space. Every month you repeat this procedure. Paint each foot a different color. And stick them above the last months. After a year you have 12 months worth of footprints walking up the door or wall. It is a wonderful memory of how small the child once was and how fast they grow. For the second year we just made footprints every quarter of the year, since the child’s growth isn’t as rapid anymore. And after the second year we decided to continue doing yearly footprints as long as we want to. I love looking at the footprints and treasuring the memories. If you are looking for a personal homemade baby-shower gift for a dear friend, then this might just be the right thing: Baby’s first year monthly photo series. This does not need much time, but is a wonderful memory for your friend. Paint the canvas. There is no limit to your creativity. 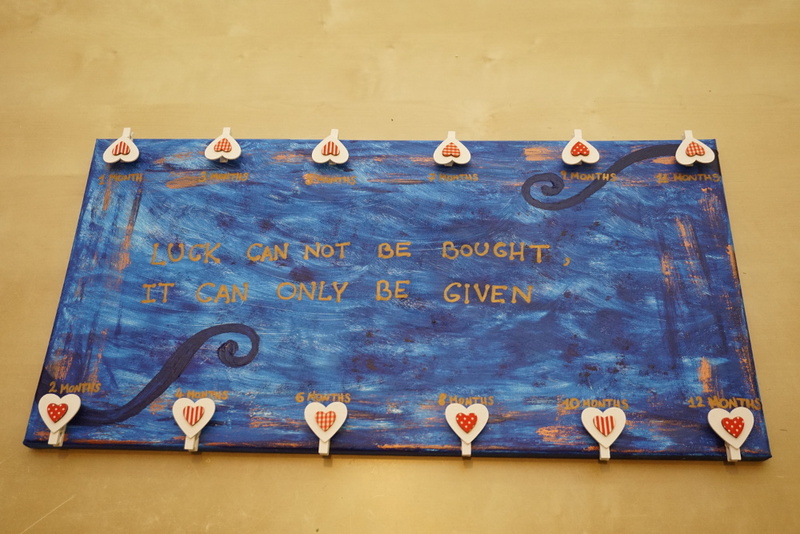 Paint colors, patterns and decorate it to suit your friends taste, whom the gift is for. I found it nice, if there is space left in the middle of the canvas to write a sweet poem or saying. 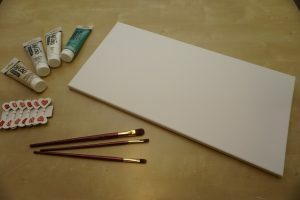 Once the paint has dried, glue the 6 clothes pegs on the top and 6 on the bottom of the canvas leaving the same gap between each one. Write “1 month”, “2 months”, “3 months” all the way to 12 months next to each clothe peg. If you like you can write a poem in the middle of the canvas. Your homemade baby’s 12 month photo canvas is finished! Don’t forget to explain to your friend, that every month they need to take a photo of the baby and hang it up on the correct clothe peg. I realize it has been quite some time, since I’ve written about Bucklethorn Forest. I have a lot going on at the moment. While working on my new book, the sequel to “Who stole the berries?”, I have a few new characters joining the new story. I thought maybe you would like to get to know one of them. Ruby is an energetic squirrel. She is fun to be around, always in movement and very curious. She loves to learn new things and finds joy in exploring. Ruby may be very active and always on the go, but she is none the less a very faithful friend. If her friends are in a pickle, she is the first to offer her help. That’s all for now, I don’t want to spoil any more of the surprise about the second book. While strolling through Bucklethorn Forest, Puck and Fiona have stumbled across some Easter eggs. They already found a few, but are having a hard time spotting more. Can you help them find all the hidden eggs? Bucklethorn Forest wishes all a very happy, blessed Easter. Let the search begin. Have fun! I would like to give you some insight on why I chose the method I did for my illustrations. If you are interested and faced similar difficulties then I hope I can help you out a bit. I am sure there are many ways to create illustrations. I am no expert and for me it is learning by doing. I didn’t take any classes on how to illustrate so in the beginning the road was bumpy. I tried different techniques using oil pastels, water colors, acrylic paint and I even tried finger painting. Some of the techniques didn’t work for me on a practical level. The paper curled up when using the water colors and so I couldn’t scan it without strange shadows on the picture. Other methods just didn’t turn out the way I wanted them to. Painting on the computer was never an option, since I don’t work very well on computers. I lack the patience and understanding for them. A mistake I made was looking at other children’s book illustrations. Comparing and trying to copy their methods. I threw the whole idea of illustrating my own story out the window once again and let it rest for some time. After a while I decided I wanted to do this book and with my mind set on it, all began to fall into place. I got some simple colored pencils out and started to draw my characters. When I showed them to my hubby he looked at me and said, that’s your style, that’s the method you should use to illustrate your book. I am still learning lots as I move forward with the second book. Maybe you are thinking, now that the book “Who stole the berries?” is done and for sale, that I have a lot of free time. Well, things are quite the opposite at the moment. Here a little update on what’s going on with the Bucklethorn Forest book series. I am currently working three different projects, all connected to the book series “The Adventures of Bucklethorn Forest”. My first project is still my first book “Who stole the berries?”. I am busy with marketing strategies. I have made flyers, that I am hanging up in kindergartens, schools and libraries. Middle of February I will be holding my first open book reading. I am researching other marketing ideas and ways of getting my book established. My second project is translating the book “Who stole the berries?”. I’ve had many requests for it to be translated into German. For the German version of the book, I am currently looking for a publisher. This is very time consuming. My third project is the most fun for me. I am very excited to announce the second book is already in progress. The story is written and the illustrations are slowly coming together. I am hoping to publish it in 2016. If you have some time on your hands, then check out the new coloring sheets you can download for free. Stay tuned for more news and adventures of Bucklethorn Forest. The book is done and for sale! 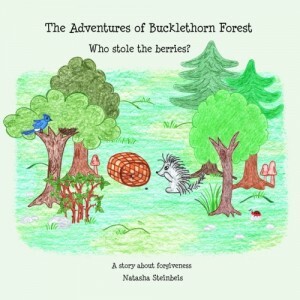 Lately I have been very busy with marketing my first book “Who stole the berries?” of the series “The Adventures of Bucklethorn Forest”. I didn’t get a chance to complete my character introductions. One very important character is still missing. I would like to make up for that now. She is not the kind of spider you may be used to… scary, spooky and quite frankly nasty. Mrs. Weaver is kind, generous and caring. She is loving, but also very much lovable. Mrs. Weaver being a spider lives in her web and takes great pride in her master piece. Her favorite food is, no surprise, flies which she catches in her web. Mrs. Weaver is older and wiser than Puck and Fiona, but still shares a very special friendship with them.